Posted in General Health & Wellness on February 10, 2014. Last modified on January 31, 2018. Read disclaimer. What effect will a new baby's arrival have on the companion animals in a household? Many people fail to consider this when they plan their families, and many animals find themselves unwanted after a baby is born, Babies and companion animals can be compatible. It simply takes planning before the baby's arrival and a little time and patience once the baby joins the household. Pet owners who actively consider how to prepare their pet and their home for a new baby will typically be rewarded with an enlarged family, not a divided one. The following are some important issues for pet owners to consider when they plan for a new baby. All pet owners, but especially expectant pet owners, should make sure that their pets are up-to-date on all their vaccinations. 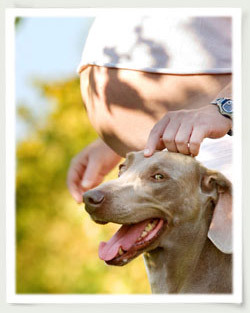 In addition, expectant pet owners should be aware of any potential problems related to pet care during pregnancy. For example, the fear of the protozoan disease toxoplasmosis often scares people into abandoning their cats when they find out they are expecting a child. Although this disease is serious, it is relatively rare for a human to catch it from a cat. Toxoplasmosis is more likely to be transmitted to people via poorly cooked meat or while gardening as by interacting with a cat. There are many positive ways to avoid this disease rather than avoiding cats. Therefore, knowledge about both human and pet health care is vital to the entire family's well-being. Hygiene also is an important consideration. Companion animals, especially those that spend time outdoors, can track potentially harmful germs and pathogens into a household. They can transmit these germs through various methods (by licking, for example). Parents should make sure that babies are kept clear of these potentially harmful germs as much as possible. As a child ages and its immune system develops, the likelihood of harm from these germs decreases. Nevertheless, personal hygiene is always important when animals and children share a home. Most of the baby's belongings should be kept in an area that the pet is not allowed to share, Moreover, if a child's pacifier or toy falls to the floor, sofa, or some other area that an animal frequents, it should always be sanitized. Wash the object with antibacterial soap and rinse it thoroughly, or run it through a dishwasher's sanitizing cycle. Because of hygiene, some expectant parents may decide to keep cats and dogs indoors or outdoors only, thereby limiting their child's exposure to pathogens brought in by a pet. When pet owners make this decision, they should ensure that the transition occurs several weeks before a newborn arrives so that family pets will not encounter two big changes suddenly: the arrival of a new family member and a change in their circumstances. Babies bring many new sounds to a household, and not all of them are pleasant. Babies are notorious for crying. A high-pitched infant's wail can be nerve-wracking for the adults in the household, and these sounds can be even more intense for cats and dogs because they hear much more acutely than humans. Pet owners can play recordings of infants around their pets before a baby's arrival. Getting the pets accustomed to baby sounds may help lessen their curiosity and reactions to the new sounds once the baby is in the house. Baby recordings can be purchased via the Internet just for this purpose (www.preparingfido.com). Although the recordings may not completely mimic the arriving newborn, they will help the pet begin to adjust. Babies also bring many new smells to a household. As with their hearing, cats and dogs smell much more acutely than humans. By introducing many of the new "baby smells" to a pet before a baby arrives, a pet owner will decrease the degree of change that the pet must experience when the baby arrives. Although pet owners who are expecting a baby will probably not be able to use "practice" smelly diapers, they can use baby lotions, powders, shampoos, and wipes around their pets before a baby introduces these smells. This reduces the pet's need to investigate the baby. Once new smells lose their novelty, household pets are more likely to ignore them. Another way to help pets adjust to new sounds and smells before the infant's arrival is to invite children to the house or take the dog to a busy park where children typically play. In general, the pets that adapt well to a new family member are those that are accustomed to being around children of all ages. Although no one can expect a pet to understand the pending arrival of a newborn, pets can slowly be adjusted to their future playmates. One pet specialist recommends that expectant parents walk around the house near their companion animals with a baby doll prior to their baby's arrival. This adjusts their pets to seeing them carry something, and it also helps with training their pets not to jump on them (especially when they are holding the doll). If training starts early, a pet will learn not to jump before the baby arrives. In addition, some of the new smells that a pet will encounter (such as baby powder and baby lotion) can be applied to the doll so that the pet adjusts to both seeing and smelling a baby at the same time. With the pending arrival of a newborn, many pet owners realize that they need to attend obedience classes with their pet. For their own safety, all dogs should be trained to respond to basic commands such as sit, stop, and stay. This becomes even more important for controlling dogs near small children. Learning these commands may take more time in older pets than younger ones, so training should start well before the baby's arrival and continue throughout the pet's life as the animal adjusts to the growing baby. Pet owners who are expectant parents may want to spend more time with their pets to compensate for less available time when the baby arrives. However, if a pet gets used to spending lots of extra time with its owner for the 9 months before the baby's arrival, it will be even more difficult for the pet to adjust to less attention after the baby arrives. This "spoil and then forget" behavior often causes pet misbehavior and separation anxiety problems that could have been avoided. Household companion animals are often very excited about baby equipment such as cribs, swings, strollers, and high chairs. Therefore, all of these items should be put together before the baby arrives and pets should be taught to stay clear of them (or even the primary room that houses them) before the baby uses them. This way the pet will not associate the infant with any new rules (and possible punishments) involving the new equipment. Ideally pet owners should research their pet before they ever adopt or buy it. Not every dog breed or pet species reacts the same way to new stimuli. Expectant pet owners should definitely make sure they research the behavioral traits of their pets before a baby enters the household. Certain breeds of dogs are known to be more aggressive than others with strangers, and these animals may need more work before they can accept a newborn or new family addition. Understanding your pet's breed-specific needs can help forge a better pet-owner relationship as well as help to ensure a safe environment for a new baby.